The key to suc­cess­ful Invest­ing is max­i­miz­ing upside poten­tial and min­i­miz­ing down­side poten­tial for every invest­ment decision. Since the future is inherently unpre­dictable, there are no “sure things” in the stock mar­ket (none that are legal…). Ergo, when bat­tling against an uncer­tain future, the best strat­egy is to max­i­mize one’s odds of suc­cess — which means “max­i­miz­ing upside poten­tial and min­i­miz­ing down­side poten­tial for every invest­ment decision. In other words, we want to be long “good risk/reward” (low risk/high reward potential) and sell/short “bad risk/reward” (high risk/low reward potential). Finding the best and worst risk/reward in the US stock market is what New Constructs is built to do. That’s the theory. Here’s how we implement. Because we cover over 3000+ of the largest and most actively-traded US stocks, our broad market perspectives are well-informed. Figure 1 highlights the pockets of inefficiency we see in the valuation of stocks across the entire U.S. equity market. The figure also shows that the market is fairly efficient on a large number of stocks as well. Overvalued stocks with overstated cash flows. Figure 2 provides another illustration of our broad-market insights into how companies’ reported profits correlate to their true economic profits. It is not a very pretty picture. Most companies, in an effort to keep up with their peers, manipulate accounting rules to overstate their profitability. Next, we overlay valuation and economic profitability to find the best and worst stocks in the market. 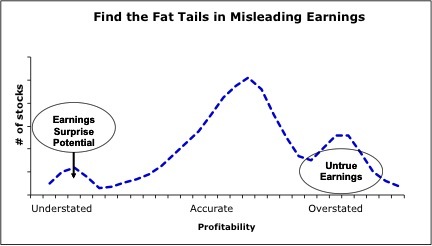 We focus on the stocks where the fat tails overlap. We want to be long stocks with the best risk/reward as measured by a very low valuation (limited downside) and understated cash flows (earnings upside). We want to be short the stocks with the worst risk/reward as measured by a very high valuation (high downside) and overstated earnings (earnings downside). All the other stocks where valuation seems fairly efficient and earnings somewhat accurate are of limited interest to us. We think focusing on the extreme inefficiencies in the market is best.